Your problems are a gift. When my kids used to complain that they were bored, I would always reply, “Awesome! That means something amazing is about to happen.” I’m sure they hated that, but it was true. I learned as a mama of 5 that if I waited through the agonizing frenzy that ensues when children don’t know what to do with themselves; if I resisted the urge to turn on the TV and temporarily end the crisis, there would come that magical moment when they would light on some creative endeavor that would then entertain them for much longer. Your design dilemmas are an opportunity too. In this home we have an indoor laundry area - not just a laundry space but an entryway from the driveway with a washer, dryer, storage, a pantry closet, and a half bath. Now this half bath is small - just a toilet and a very small sink - the kind with the pipes showing below it. 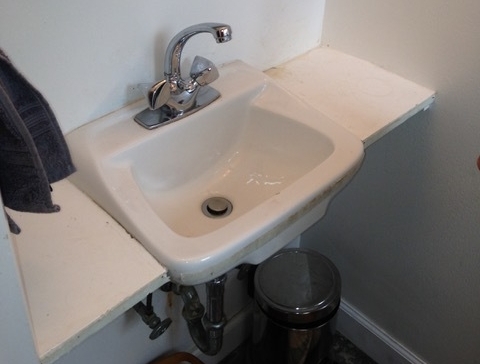 There’s no room for a vanity or cabinet below it to hide the pipes. It has a simple mirror medicine cabinet above the sink. Functional - but not pretty. The previous homeowner had cut out a lightweight piece of white melamine exactly the right shape to surround the sink and reach to the walls on either side. She had attached a simple fabric skirt to the front of the countertop with velcro and this cute skirt hung down to the floor, covering the pipes. It was an elegant and inexpensive solution - perfect for a retired couple and other careful bathroom users. But I had young children and, when they washed their paws in that tiny sink, water and whatever kind of remnants they were washing off splashed onto the fabric skirt and pooled on top of the flimsy countertop. The set up lasted all of a few weeks. Down came the cute skirt and my hunt for a teeny tiny vanity to hide the ugly, rusty pipes began. First of all, there were no vanities small enough and secondly, I had no budget for one. I was not a woman who could say, “Well, we must have a new vanity in that horrible bathroom. I’ll call our contractor and get one this week.” That was not my life. I had my 6 year old daughter help with demo and we laughed while she used a hammer to take out the little ineffective countertop. Now the pipes and their rusty imprint on the wall below were visible to everyone. I pondered and noodled on the ways one might create a “real bathroom” from this unsightly and embarrassing space. I looked online for tiny vanities, frustrated by their cost and annoyed by the lame plans of the man who had installed a bathroom this small. Abby taking out the weird countertop. Weeks went by. Months too. I’ve learned over the years to attend to these ideas, so I went to our local Ace Hardware and stood in the plumbing aisle staring at all the fittings. No less than 4 employees asked me if I needed help, (because that’s what they do at your local Ace Hardware, right?). “Um, I don’t know yet,” I replied. I finally confessed to the 4th confused employee that I was designing my bathroom around the theme of pipes. I picked up a curved piece of pipe and asked how I might attach it to the wall as a towel holder. I was directed to some metal clamps and screws. On the next aisle, drawn by more shiny metal, I picked up two grates - the kind you put over the vents to your crawlspace. I was given screws, washers and more brackets with which to attach these to the wall as shelves. I came home and attached my metal grates to the wall as shelving. I fastened the curved pipe to the wall for a towel rack. In the side yard I spotted the remains of two once beautiful adirondack chairs that I had picked up at a garage sale and which, sadly had finally begun to fall apart. The wooden arms were a weathered gray with specks of old white paint hanging on them. I took two for wall art. I used some fabric I’d been hoarding to cover two artist’s palettes with spray adhesive and a staple gun. Over the next few weeks I found a black bird item and, feeling like a shot of red would add a nice touch, I found a fake red flower at Michaels and stuck it in a metal bucket - held down by wood bark chips found in the yard. Over the next few weeks I found a black bird item and, feeling like a shot of red would add a nice touch, I found a fake red flower at Michaels and stuck it in a metal bucket - held down by wood bark chips found in the yard. For Christmas that year, my sister, hearing about the pipey bathroom design, gave me a cute soap holder and the design was complete. I love that pipey bathroom. I’m proud of it and happy to offer it to guests when they ask to use a bathroom. It’s quirky and charming and it feels like I’m offering friends a glimpse into my personality and my story when I offer them that room. I’m thankful that my story has dilemmas and surprising solutions. If it didn’t I think I might be bored. 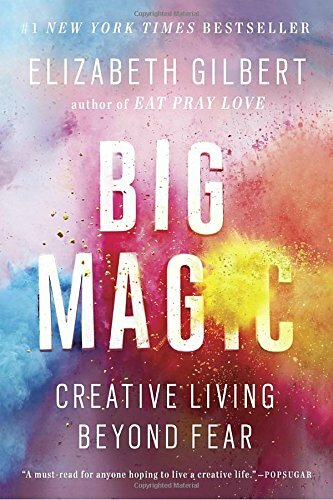 If you haven't read or listened to Elizabeth Gilbert's book, here's a link to find out more about it (and yes, it's an affiliate link).